← Think chocolate hazelnut spread is healthy? Happy St. Patrick’s parade day New Orlenians! Bring 1 cup of water, salted, to a boil with 1/2 cup mixed grains (I used bulgur, buckwheat groats, and oats) 1 T raisins, and spices (cinnamon, ginger, nutmeg). Once boiling, pour in 1/3 cup egg white and stir constantly. Once egg white is cooked and distributed, allow grains to continue cooking on medium until the desired consistency is reached, adding water if necessary. Stir in 1/8 cup of ground flax at the end. Meanwhile, thinly slice apple and microwave with cinnamon for 2 minutes. 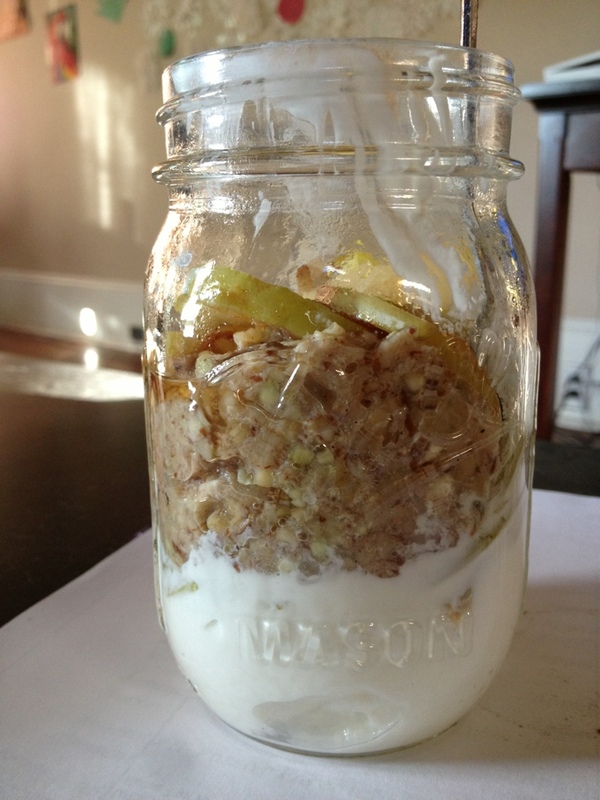 When all the parts are complete, layer plain 0% Greek yogurt, apples, and grains in a jar. Be full allllll morning from the awesome staying power of protein and fiber. Drink green beer and beware of flying cabbages. Image | This entry was posted in Nutrition, Recipes and tagged breakfast, breakfast parfait, breakfast recipe, buckwheat, bulgur, grains, groats, healthy, NOLA, nutrition, oatmeal, oats, recipe, st. Patrick's day parade, wheat, whole grains. Bookmark the permalink. You’re welcome! I have been having a good time trying different grains from the bulk bins lately – just google the proper water:grain ratio and experiment!